When it comes to local internet marketing and reputation management, perhaps no website is more important to companies than Yelp. In the unlikely event that you don’t know what it is, Yelp is a site that allows customers to share their opinions about local businesses. Users can submit reviews, positive or negative, and business owners have the opportunity to claim their listings and respond. 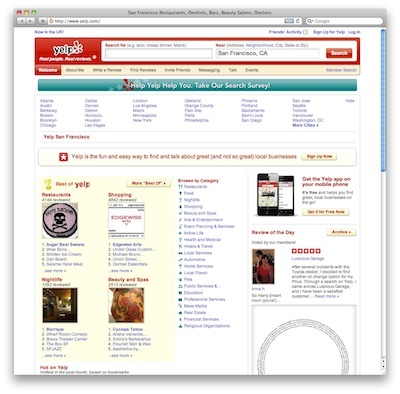 The site was getting about 39 million monthly unique visitors as of late 2010, so clearly consumers use Yelp on a regular basis to research local businesses and determine which ones they can trust. Therefore, if you own a local business, it only makes sense that you want to get as many Yelp reviews, positive ones I might add, as possible to boost your rankings. But the website does have some rules that businesses have to play by. And one of the things Yelp strongly discourages is bribing customers to review your company on Yelp. In other words, offering customers a 20% discount on their next purchase if they review your company on Yelp, even if it’s a negative review, is frowned upon and could get the review deleted. So, what can you do to get more Yelp reviews without bribing customers? Here are a few suggestions. Claim your business page – The first thing you need to do is unlock your listing on Yelp. This is a simple process that involves Yelp verifying that you actually do in fact own your business. Once unlocked, there are numerous things you can do with your Yelp page, like respond to reviews, add photos, customize your listing, etc. Respond to your reviews – When you show people that you’re paying attention to your Yelp page, they’ll be a little likelier to share their feedback because they know you’re going to see it. Responding to reviews lets customers know their voice actually counts for something. Be great every time – There are millions of Yelpers out there. Chances are, your business serves some of these users on a regular basis. Want to get more reviews? Be great every time. Provide service that’s so good your customers just have to tell someone about it. Post discounts and special announcements – When you claim your Yelp business page, you’ll be allowed to post special offers and other updates through the website. This could give searchers on Yelp an extra incentive to check out your business and later review it. Promote your Yelp page across social media profiles – Again, don’t bribe your customers or tell them to leave you a good review. Simply remind your friends on Facebook, Twitter, and other social media sites that your business is on Yelp and they can submit reviews. What are some other tactics businesses can use to get more Yelp reviews? Share your thoughts by leaving a comment below. Great list! I also think being honest and just mentioning to clients/customers that you are trying to build up your Yelp page is a decent way to do it. Of course, it’s important how it is presented so it doesn’t come across as begging for reviews rather sharing that your would welcome a Yelp review if they are so inclined.